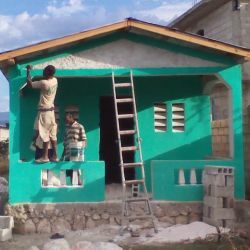 The United Church of Christ provides $114,000 to build 20 new Fuller Center homes in Haiti, 18 of which are built in the Croix-des-Bouquets area. The Fuller Center adds covenant partner in Western Cape, South Africa. A 68-person team from Countryside Mennonite Fellowship near Waterloo, Ontario, becomes the Global Builders’ largest-ever work team on their trip to Nicaragua, also pushing the Global Builders past the 2,000 participant mark all-time. Click here for a report on the trip. The Fuller Center for Housing of Armenia reaches an agreement to assist low-income families in building safe, decent and affordable homes in the Republic of Artsakh. The project traces its roots to the top of Mount Ararat, where Noah’s Ark came to rest in the Biblical story of the Great Flood. In August 2013, Artsakh Prime Minister Ara Haroutyunyan’s spokesman Artak Beglaryan and Fuller Center of Armenia Development Director Gohar Palyan were in the same group of hikers to ascend the legendary 16,945-foot summit. Their discussion during that trip led to the formal agreement. A total of 26 cottages donated by the Mississippi Emergency Management Agency to the city of Greenwood are given to The Fuller Center to use in the city’s Baptist Town neighborhood. The cottages were originally designed as homes for residents displaced by Hurricane Katrina in 2005 and sat unused in storage for months as the transfer required state government approval. Mississippi Gov. Phil Bryant signs a law approving the plan, a measure that passed the state’s House of Representatives 120-2 and Senate 51-0. Click here to learn how they’ll be used. The 6th Annual Millard Fuller Legacy Build is hosted by The Fuller Center for Housing of Louisville. A piece by Fuller Center Director of Communications Chris Johnson appears in the New York Times’ “Room for Debate” section on the topic of “Can ‘Voluntourism’ Make a Difference?” Click here to see the debate. Annual Fuller Center Bicycle Adventure begins with a Build Day in Atlantic City, then sets off on 3,600-mile journey to Astoria,Oregon. Millard Fuller Boulevard (formerly Spring Street) is officially dedicated with a march and celebration in Americus, Georgia. The celebration features speeches by former President Jimmy Carter, Fuller Center co-founder Linda Fuller Degelmann, Fuller Center President David Snell and others. Click here to view a video about the special occasion. More than 250 World Changers work on a record 32 projects with the Ginger Ford Northshore Fuller Center for Housing in the Hammond-Ponchatoula area of Louisiana. Katherine Jackson, mother of the late King of Pop Michael Jackson and matriarch of the musical Jackson family, visits with Fuller Center Bicycle Adventure cyclists during their work day on Jackson Street in Gary, Indiana, where The Fuller Center is beginning its work in the city. Mrs. Jackson is brought to tears when she sees the improvements coming to the street where she raised her family. The Fuller Center Bicycle Adventure crosses the $1 million all-time fundraising mark. The Fuller Center of Gary, Indiana, hosts the Jackson Street of Dreams Build, coinciding with events marking the birthday of the late King of Pop, Michael Jackson. Fuller Center Global Builders, featuring several team leaders from previous trips, complete 56-home Lambi Village community in Haiti. Desert Communities Fuller Center builds home in just three days for veteran and his family in Twentynine Palms, California. The 40 Years in Africa campaign officially concludes with the completion of 40 homes, including 24 in Nigeria. A strong earthquake rocks Nepal. Fuller Center homes in the Trishuli village, just 30 miles from the epicenter, all make it through the quake unscathed. Inaugural Lind-A Hand Build (Linda Fuller’s Build for Women) a great success as women volunteers build home in partnership with family in Lanett, Alabama — hometown of Millard Fuller. Fuller Center Bicycle Adventure’s 4,000-mile summer ride from California to Maine begins. Fuller Center of Armenia hits 400-home milestone. Fuller Center announces plan to build 200 permanent, safe homes in Nepal in response to April’s earthquake. First new home in Thailand dedicated. Fuller Center Disaster ReBuilders wrap up 10th Anniversary Back to Biloxi Build. Bicycle Adventure’s 4,000-mile ride from California to Maine concludes. Millard Fuller Legacy Build wraps up in Shreveport, La., with dedications of four new homes and one major rehab project. View video here. Dozens of volunteers build 10 homes in Las Peñitas, Nicaragua, during the 10 Years, 10 Homes Build. Fuller Center announces partnership with New Story Charity. New Story will raise funds for materials to build 90 homes in El Salvador in 2016, with Fuller Center funding infrastructure and associated costs. (More than 200 have now been built through the partnership.) Success in El Salvador leads New Story to announce they will also fund 60 new Fuller Center homes in Bolivia. Co-founder Linda Fuller marks her 75th birthday with $75,000 fundraising campaign. The #Linda75 effort also includes a celebration at Columbia Theological Seminary in Decatur, Ga., a build day in Macon, Ga., an online auction and a celebration at Koinonia Farm with many of Linda’s longtime friends, including former First Lady Rosalynn Carter. Fifty students from Wittenberg University help school launch new partnership with Fuller Center’s U.S. Builders program by spending spring breaks working with covenant partners in Tallahassee, Fla., Perry, Ga., and Albany, Ga.
Dedication of first new home in South Africa. Bicycle Adventure’s weeklong spring ride down Natchez Trace features two build days for first time — first in Nashville, Tenn., and later in Greenwood, Miss. For the third straight year, the ride raises more than $40,000. VivaCell-MTS, a long-time supporter of our work in Armenia, funds its 100th home through its partnership with Fuller Center Armenia. University of Georgia’s Russell Library Oral History Collection shares video of interview with Fuller Center co-founder Linda Fuller. 3,500-mile Fuller Center Bicycle Adventure begins in Seattle, bound for Washington, D.C. Due to record participation, the ride is divided into an Orange Ride and a Blue Ride that departs one week later. The ride also will go on to break fundraising records, reaching its $250,000 goal in July and nearing $300,000 by the August conclusion. Partnership with New Story a resounding success as first families begin moving into new Fuller Center homes in the Nuevo Cuscátlan community of El Salvador. Meet some of them here. Fuller Center Armenia completes its 500th home! Neighborhood revitalization project uniting Fuller Center of Louisville and Southeast Christian Church draws nearly 1,000 volunteers over three-week period in West End of Louisville. Better Homes & Gardens Real Estate and New Story Charity announce that they will team up to support Fuller Center in building a second complete community in El Salvador — this one in Ahuachapan. Fuller Center for Housing awarded GuideStar’s highest-level certification of Platinum for transparency. Three new homes and one major renovation dedicated after weeklong Millard Fuller Legacy Build in Valley, Alabama, adjacent to Millard’s hometown of Lanett, Alabama. Independent audit shows 86 percent of Fuller Center expenditures goes directly to programs in the field, significantly above average. Hurricane Matthew makes landfall in Haiti, causing widespread damage. All Fuller Center homes, including the 56-home Lambi Village, emerge unscathed. Fuller Center Disaster ReBuilders wrap up two-week blitz build in Ocean Springs, Miss., having involved more than 200 volunteers. Fuller Center President David Snell joins People Helping People and others to tour nearly complete 90-home community in Nuevo Cuscatlán, El Salvador, and visit site of next community project in El Salvador, Ahuachapán. Albany Area Fuller Center for Housing responds to widespread repair needs after straight-line winds early in the month and a tornado later in the month cause damage. Fuller Center Disaster ReBuilders establish base in Denham Springs, La., to help residents in Livingston Parish area recover from previous year’s massive flooding. About 50 students from Wittenberg University again spend spring breaks working with Fuller Center covenant partners in Atlanta, Americus, Perry and Albany, Georgia, as well as Tallahassee, Florida. Full report here. With more than 20 former Habitat for Humanity affiliates having switched to partnering with The Fuller Center, an extensive report examines the reasons behind their move — reasons including local control, grass-roots principles, paying no annual fees and more. Full report. Fuller Center volunteers repair two homes during Higher Ground on the Bayou Blitz Build in Louisiana with Ginger Ford Northshore Fuller Center, which also hosts Fuller Center Annual Conference later in the week. Better Business Bureau President and CEO Art Taylor interviews Fuller Center President David Snell for its Wise Giving Alliance Building Trust video series. Watch it here. Fuller Center hits 200-home milestone in Haiti with its 38th house dedication in the community of Pigñon. The 38th home here is the first in the community built exclusively with repayments from the first 37 homes in the community, exemplifying how The Fuller Center’s pay-it-forward, hand-up model works. Family Life Radio’s “Vantage Points” radio program features extensive interview with Fuller Center Director of Communications Chris Johnson about the ministry’s principles and its successes. Fuller Center Bicycle Adventure’s summer journeys begin on West Coast with fundraising goal of $400,000, which would bring ride’s all-time fundraising mark over the $2 million mark. The cross-country ride will go from San Francisco to Savannah, while the West Coast ride goes from Seattle to San Diego, to be followed by an East Coast ride from Portland, Maine, to Key West. K’Hairi’s Christmas Wish two-week blitz build in West Point, Georgia. Volunteers complete home in partnership with Army veteran Carla Ross, whose son suffers from sickle-cell anemia yet asked Santa Claus each year only for his mother to have a decent house. Volunteers restore faith to east Indianapolis neighborhood by working on five new homes at the 2017 Millard Fuller Legacy Build. First new Fuller Center homes in Madagascar dedicated. United Church of Christ Disaster Ministries commits another $50,000 to build more homes in quake-ravaged Nepal. Fuller Center of Armenia builds its 600th home with volunteers from Christian Youth Mission to Armenia. Fuller Center Disaster ReBuilders, already working on flood repairs in Louisiana, begin making plans to help families in Houston area recover from Hurricane Harvey. Bob and Leslie Bell lead first Global Builders trip to Papua New Guinea. Fuller Center puts out call for partners willing to help Puerto Rico recover from Hurricane Maria. Latest independent audit shows 90 percent of gifts to The Fuller Center go directly to work in the field, among the highest percentages in the nonprofit world.